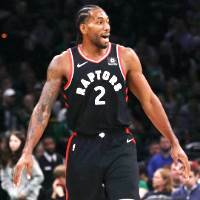 Toronto’s Kawhi Leonard scored a career-high 45 points, Pascal Siakam had a career-best 28 points with 10 rebounds, as Toronto beat the Utah Jazz 122-116. Norman Powell scored a season-high 14 points, and the Raptors won their fourth straight at home despite playing without All-Star guard Kyle Lowry (sore back) and center Jonas Valanciunas (dislocated left thumb). Leonard shot 16 for 22 overall, missing all three attempts from 3-point range, and went 13 for 17 at the free-throw line. He said he wasn’t aware of his scoring achievement until after the game. It was the third 40-point game of Leonard’s career, including a 43-point effort against Memphis in Game 4 of the first round in April 2017. Leonard has scored 20 or more points in a career-best 14 straight games. Jae Crowder, who went 5 for 7 from 3-point range, scored a career-high 30 points, Derrick Favors had 21 and Donovan Mitchell scored 19 as the Jazz dropped to 10-12 on the road and 18-20 overall. Leonard made all seven of his field-goal attempts in the third quarter and added five foul shots. His 19 points were the second most in any quarter by a Raptors player this season. Furthermore, all those points allowed the Raptors to set a franchise record with 44 points in the third quarter. Utah’s Rudy Gobert scored 16 points, and Ricky Rubio had 14. Rubio started after sitting out Saturday’s win over New York because of a sore left knee and sore lower back, while Crowder was back after missing the victory over the Knicks because of a sore left thumb. With this result, the Jazz has lost five of six on the road and nine of 12 meetings against Toronto. The win improved the Raptors to 5-2 on New Year’s Day, including a 4-0 mark at home. The Raptors now travel to San Antonio to take on the Spurs on Thursday, while the Jazz will visit the Cleveland Cavaliers on Friday night.